Open the file lambda.gcc and note that the HindIII (and EcoRI) sites are already marked. Open the construct pBluescript SK+ and mark the HindIII site by using Construct > Features > Mark Sites. You should end up with a single site marked in the blue-striped region of the DNA. Click on the HindIII site marker text in pBluescript SK+ to select it. This also sets the cursor in the DNA to the cut site for HindIII. Choose Tools > Shotgun Cloning… . We will be taking all of the lambda HindIII fragments and cloning them into the HindIII site of the pBluescript SK+ vector. In this case our target site is already selected in the pBluescript SK+ vector and the source of the DNA is lambda, as shown in Figure 2.83. Note that you can choose a different enzyme in which case GCK3 will find all of the sites for you. You can choose a folder for the output (as done here) or you can ask GCK3 to create one for you by checking the checkbox next to Create a folder to contain the constructs. You also need to provide a root name for the constructs – in this case the constructs will be named test-0, test-1, test-2 etc. Once your window looks like this figure, press the Generate Constructs button. You will see a confirmation dialog Figure 2.84 telling you what is about to happen. This dialog is provided so that if you accidentally are about to generate hundreds of constructs, you will not be surprised by all of the files generated in this process. Press the OK button. There are now 5 new constructs in the folder you designated, each containing a particular fragment of lambda DNA inserted into the HindIII site of the vector. The first such construct is shown in Figure 2.85. Notice that the inserted segment is already highlighted for you. 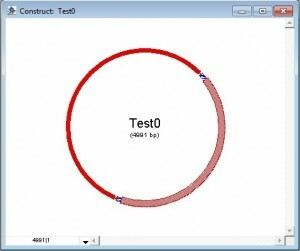 This entry was posted in gene construction kit tutorials and tagged Gene Construction Kit, Gene Construction Kit Tutorials, Shotgun Cloning, Tutorials. Bookmark the permalink. Post a comment or leave a trackback: Trackback URL.